One of my favorite ways to keep our meals from becoming repetitive is to constantly combine ingredients in new ways but use trusted and known techniques. It's amazingly easy to do if you just use the same principles you know but throw in a new twist or flavor. A great example of this is my "Roasted Baby Artichokes, Fennel and Organic Carrots". Most people who cook have a repertoire of go-to dishes. Roast chicken, for example, is a very common one. But, instead of using carrots, onions and potatoes as your side of roasted vegetables, add at least one or two different ingredients to your classic method. That's exactly what I did for this one and it turned out great. The yellow, purple and orange organic carrots were so pretty that I knew I couldn't do the same old thing with them to eat with a roasted fish. So, with a little thought -- "Hmmm, fennel roasts wonderfully sweet and is a good complement to the carrots. 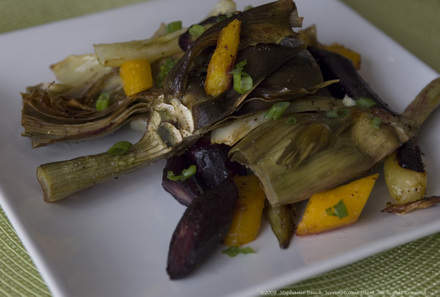 Artichokes would provide a great less-sweet earthier flavor and different texture." I knew it would turn out wonderful. This dish is so simple and a delicious mid-winter variation on the typical roasted vegetable side dish. 1. Preheat oven to 400˚F and wash, peel and prep all the vegetables. Cut the pieces of fennel and carrot in roughly the same size. 2. In a large non-reactive bowl, mix the vegetables, olive oil, lemon, sea salt and pepper (use everything in the ingredients list except the scallions here). Toss thoroughly to coat vegetables evenly. Spread into a single layer on a rimmed baking sheet. 4. Remove the vegetables from the oven and drizzle a little olive oil, a squeeze of lemon juices and garnish with the minced scallions. 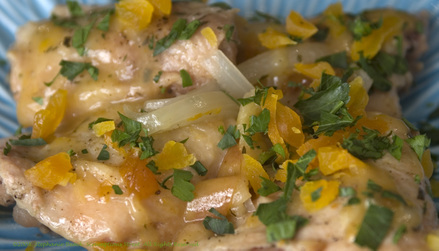 Serve immediately with roasted chicken or fish. A note here about the artichokes: they must be fresh and tender for this dish to work. If they aren't the artichokes will be fibrous and chewy since they aren't pre-cooked or blanched. 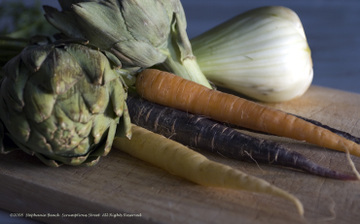 If you don't have good artichokes try another vegetable with the carrots and fennel. Good options are beets, portabello mushrooms or Brussels Sprouts.